In our article on carbon capture and storage we looked at how carbon dioxide emissions from power stations can be reduced if we capture the gas and store it under the ground. Unfortunately this process is very expensive. Trees do an excellent job of removing carbon dioxide from the atmosphere, but when they are burned or rot down at the end of their lives, the gas is released straight back into the atmosphere – the carbon cycle. If wood is partially burned in an oxygen-poor environment it turns into charcoal – virtually pure carbon, and chemically very stable. 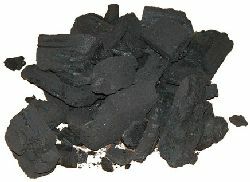 Unburnt charcoal is therefore a carbon sink potentially holding carbon for hundreds or thousands of years and reducing the overall concentration of carbon dioxide in the atmosphere. When charcoal is made for this purpose it is called biochar. A side-benefit of biochar is that it can be dug into soils to increase agricultural yields and to improve soil fertility (as explained below). Making charcoal is a very cheap and simple process whereas removing carbon from power station emissions is expensive and complicated. By making biochar in poor tropical regions, it offers local farmers a chance to earn a living, and for local agricultural land to be improved. 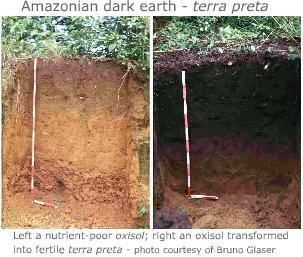 Terra preta is Portuguese for dark soil. In the Amazon basin in Brazil there are regions where the soil is very dark thanks to carbon (charcoal) concentrations two to three times higher than found elsewhere. These soils are famed for their high fertility. Currently the reason for the increased fertility of the terra preta is not fully understood, but it is believed that the porous sponge-like structure of charcoal (i.e. the thousands of tiny holes throughout each piece of charcoal as pictured above under a microscope) gives a huge surface area onto which nutrients can adhere, and beneficial micro-organisms can cling thereby improving the quality of the soil over time – i.e. the charcoal acts as a catalyst for soil improvement. Biochar can also be laced with elements such as potassium to increase the rate of soil improvement when it is dug into the ground.